Been years since i knit a wool Throw & i thought its about time i knit another ! In the past i have knit throws from crappy acrylic, scratchy old sheep wool but the best were knit from soft Buffalo yarn or musk ox wool. Every throw has been gifted to friends or Family or sold as a custom knit order. Our kids grew-up wrapped in hand knit throws & to this day they still mention them from time to time. I'm sure when this is finally finished there will be heated debate over who gets to keep it ! ....all spun the same yardage & weight so the finished throw will be perfectly dimentional. When starting a new project on this scale its fun working out what pattern stitch to use next & then fitting all the colours together. You must knit several squares from all colours before you decide what goes where. Before sewing you must wash & block the squares. I like to knit say 10 squares and then wash and block. To Join up squares you sew the cast off edge to the cast on edge...EVERYTIME WITHOUT FAIL & always try to have the knitted squares moving in the same KNIT direction(from cast off edge-to cast on edge). This gives a professional neat & tidy appearance to your finished work. The stitch designs i will be using will include Cables, Fairisle, Stripes, Knit & Purl Texture sts and then the whole thing finished off with a lovely sturdy border. The 1st square knit from the ''Shetland Tundra'' yarn (from the month of May blog entry) in a natural brownish colour. will add more blocks as the days go by & will include the pattern for each square so whoever wins the yarn will be able to knit their own soft shetland throw & possibly have it finished intime for the chill of fall or at least Christmas time ! will post the number of blocks needed in each design nearer the end of the project. From: 7th June 2013 TO 30th September 2013.
simply name this 'Blanket design' keeping in mind the yarns are: all Shetland Wool with a small amount of musk ox/qiviut yarn and that the blanket will use all natural colours, that the blanket is a sampler style and uses cables, stripes and fair isle throughout. Open to knitters world wide. 1 winning name will be announced and you will be notified via this blog. The design has a large central block in white that measures a total of 4 blocks -2 up, 2 down in Old Scottish Stitch cable design. Blocks are added to this central block and the design builds outward in a clockwise direction. Bath sheet and blocking pins or regular straight pins. Tension is not important but ALL squares must be similar size of about 9'' X 9'' (before blocking) This will always be 35 to 38 sts X 45-50 rows per block ! Foundation Rows 1: (RS) knit across inc 10sts evenly 48sts. Row 1:(RS) *p3, k6, rep from * to last 3 sts, p3. Row 2: *k3, p6, rep from to last 3 sts, k3. Row 3: *p3, C6B, rep from to last 3 sts, p3. Rep all 6 rows above ending on row 5 with 7 cable twists complete, on next WS row decrease 10 sts evenly by purling 2 sts together method then on next knit row bind/cast off all 38 sts. with 4.5mm's cast on 35sts with the Tundra Shetland yarn. 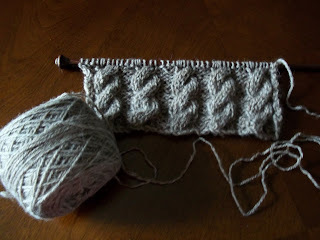 Knit 2 rows, then change to white yarn and knit another 2 rows. 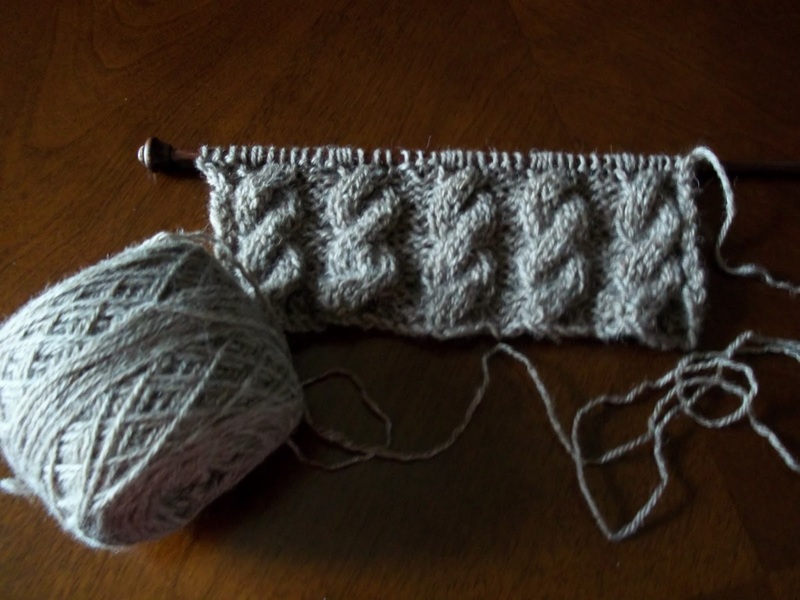 Continue until 48 rows are worked finishing in the Tundra shetland yarn, bind off all 35 sts. Both sides of these blocks are used in the design and placed in reverse at 4 corners of the large white centre block. Block #4 is a Gansey pattern of knit and purl sts that form pleasing ridges of texture. With 4.5mm cast on 37sts. 8: k3, (p1, k5) to last 4sts, p1. k3. 9: p2, (k1, p1, k1, p3) to last 5sts, k1, p1, k1, p2. 10: k1, (p1, k3, p1, k1) to end. 11: k1, (p5, k1) to end. 17-23: as 1st to 7th row. 32nd row: knit. bind/cast off then make another 3 blocks. Block #5 *** make 6 blocks*** 3 white and 3 brown. Garter edge blocks can be jazzed up a bit by adding some beads. 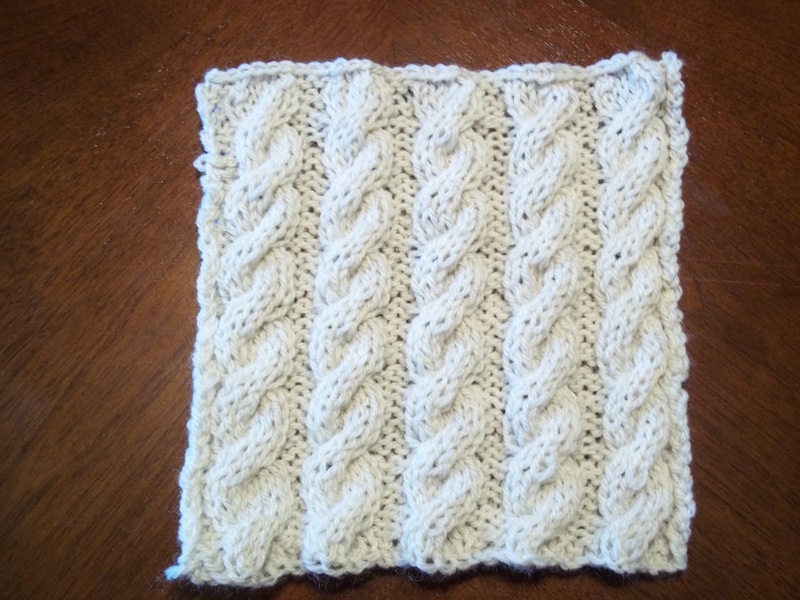 To knit this block cast on 35sts with 4.5mm needles. Rep rows 7 and 8 until work measures 6'' inches. Then rep rows 1-6 then cast off all sts. with 5mm needles and brown shetland yarn cast on 40 sts. I got a little sidetracked ! I received a very special order from the Government of Canada to knit a special gift. At the moment i am not allowed to say what or who the gift is for until its delivered to the family in question. The item is now finished so i can get back to the Shetland sampler blanket. I have taken the day off work from the mill to get caught up on the design. I ♥ a day off work, lounging around in PJ's all day......bliss. I removed the dark grey from the mix as i thought it was too dark to balance the overall design. The large central pattern is called 'old Scottish stitch', i took from an old stitch book because i liked the idea of lace and cables together. The flower of Scotland is a Thistle plant/weed and i don't think this old Scottish stitch looks anything like a thistle ! I searched all over the internet trying to find about this stitch to no avail. If you know anything please let me know about it. work is coming along nicely but i will need another month to finish because i really want to add some fair isle blocks to this especially some tartan . My apologies for having to add another 30 days to the run time of this post....just not enough hours in the day ! here are 2 colours i will use in some of the fair isle & possibly a round or two in the Border. The yellow is a lovely 'happy colour' and the orange is 'Tiger Lily'. Both these colours if used sparingly will be lovely against the natural earth tones to really bring out the beauty of the natural colours. Both these yarns are 100% white shetland dyed with natural plant dyes. I may also have to add some rich red or possibly wood rose or strawberry red. To Make the images larger simply click on them and you will be able to scroll through larger images ! I won some gorgeous yarn from you last year so I hope it's okay to enter for this generous "Blanket design" kit! Been reading some of your posts looks like you love the country life as much as me....we are blessed. The first thought that comes to mind is Potluck Sampler Throw. how about Woolen Hugs blanket? I'd call it "Cuddle Up". I'd call it Tundra, the Swedish word for the northern wide grass fields. Generations Throw, because I think it would be very timeless and I could see my kids loving it just like yours! I'd name the pattern, "Shetland in the Snow", or "Shetland Tundra Tracks". I never thought of having to name a pattern and once you start to contemplate a suitable title, it seems like an endless thought process. I like many of the above suggestions and my addition to the list would be: "Clovis Ovis"
"Wool of the Earth" throw blanket. It is beautiful. Or "Hug Me Softly with Wool"
I would call it "Northern Warmth" because the qiviut comes from the North and it is so beautiful and warm, the name of the blanket has to refer to it! Thanks for the chance to win this beautiful blanket kit. My Name for it would be "Echos of Land and Sky" blanket. This is starting to look like a "Classic Ovis Checks" blanket"
"In The Mix" or "Shetland In The Mix"
who ever gets to own this will be lucky indeed! SO MANY GREAT NAMES....how will i choose ! Wow, this is going to be epic! 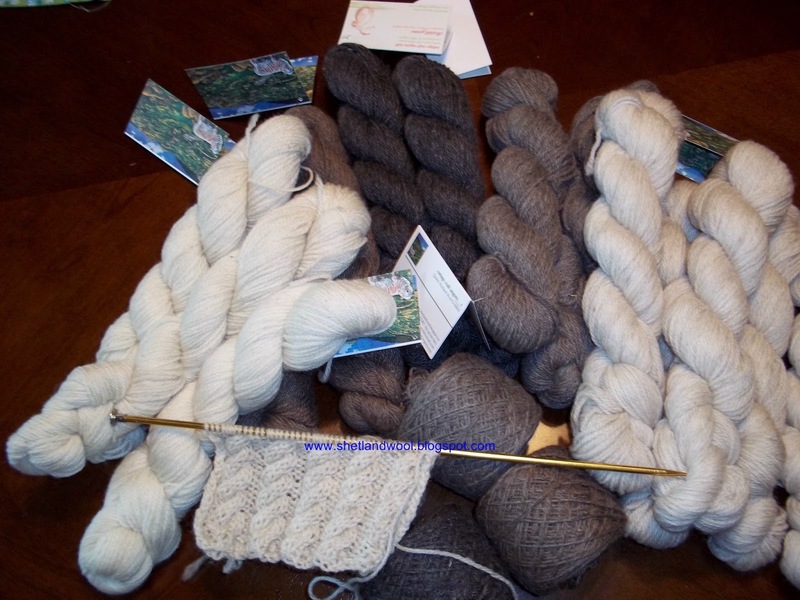 I am just done ordering a whole lot of wool for a sampler blanket of my own. Since I have the design aesthetic of Liberace's Magpie, I have about eleventy colors in mine. I will definitely look to include some of these squares. Though I am primarily working from Walker's Learn To Knit Afghan book, some of the squares don't tickle my fancy. Luckily, I have the entire internet and many stitch dictionaries. Thank you for these photos, I really liked them.